creates income equal to the amount spent. This is the case whether the central bank is (A) permitted to purchase government bonds directly from the fiscal authority (‘overt monetary financing’) or instead (B) is required to buy them from the private sector (currently the procedure under “normal” circumstances in many countries). It is also true if (C) the government simply spends without issuing bonds and pays its policy rate (which can be zero) on reserve balances. Procedure B is far more convoluted than either of the alternatives, for no real public purpose. An earlier post traces through six steps (identified by Scott Fullwiler) that are involved when the US government requires itself to match net spending with bond sales to the private sector. The effects are presented in terms of simplified balance sheets of government agencies (the central bank and fiscal authority) and members of the non-government (primary dealers, commercial banks, spending recipients). With overt monetary financing, the balance sheet entries are much simpler to summarize. To illustrate, suppose the government spends 10 (million, or perhaps billion) dollars. Rather than six steps, overt monetary financing basically involves two. In step 1, the monetary authority (central bank) would buy new bonds issued by the fiscal authority (the Treasury). It would pay for these by crediting the Treasury’s account, held at the central bank. This initial step has no impact on non-government. Nor does it alter the net financial position of the consolidated government sector as a whole. The assets and liabilities of both the central bank and Treasury rise by 10. The change is merely compositional (and fictitious). The central bank owns more bonds (an asset of the central bank) but holds an additional liability (an increased balance in the Treasury’s account). For its part, the Treasury has an increased balance in its account (an asset) but an offsetting liability to the central bank in the form of bonds. In step 2, the Treasury draws down its account at the central bank in order to spend. It directs the central bank to credit the reserve accounts of the banks at which spending recipients hold accounts. The banks in turn credit the accounts of the spending recipients. 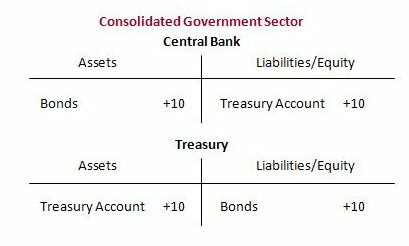 Keeping in mind that total financial assets must equal total financial liabilities, it is evident that the net financial liabilities of the government sector must be offset by net financial assets held by another sector (the non-government). Clearly, that is the case. Although the banks in aggregate experience no shift in position – their assets (reserves) and liabilities (deposits) both increase equally – there is a net gain for recipients of the spending. They now possess additional financial assets equal to the amount of government spending without any corresponding increase in liabilities. There is also an increase in the net worth of the non-government taken as a whole. The offsetting financial liability, as already seen, is in the government sector (the depleted Treasury account). The impact of the government spending is therefore as expected. 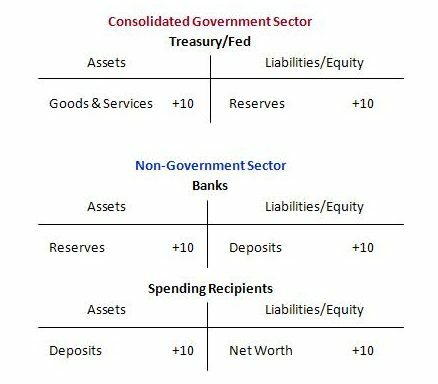 First, the non-government has additional net financial assets equal to the amount of government spending. And, second, since the government spending will be for the purchase of goods or services, there is creation of new income, which is received by members of the non-government (the spending recipients). In this approach, the Treasury or the central bank, or a merged government agency, would spend simply by adding reserves to the banking system and instructing banks to credit the accounts of spending recipients. This would do away with the fiction of the government needing to “borrow” and also make clear that it is the act of government spending itself that creates government money in the form of reserves. Be more efficient. There would be no need for superfluous activity (e.g. the Treasury auction) that takes up the time of those involved without serving any public purpose. Be more transparent. There would be no more obscuring of the fact that a currency issuer is the source of the currency and never beholden to private markets or “bond vigilantes” for financing in the government’s own unit of account. Greatly simplify short-term interest rate management. Open market operations are not needed for this purpose. The policy rate (if positive) can be paid on reserves. In addition, overt monetary financing would remove a form of corporate welfare. It would stop interest payments on risk-free financial assets going into private hands whenever government net spends (profits of the central bank are turned over to the Treasury). The same will be true of interest on reserves whenever the policy rate is set to zero. It can be noted, in closing, that adopting the simpler procedures would not prevent government from selling bonds to non-government for other purposes, such as to provide non-government with alternative saving vehicles, if this was deemed desirable. But there is no need for these asset swaps, if pursued, to be entwined in short-term interest rate management or be framed as the government “borrowing” from the private sector what it alone can issue. Nor should such bond issuance be tied to government net spending. Any decision by government to offer bonds to savers is at its discretion and not necessitated by its own spending behavior. The first of these three posts is by Scott Fullwiler; the latter two by Bill Mitchell. The policy rate (if positive) can be paid on reserves. But that’s welfare proportional to fiat account balance at the central bank so IOR is another form of corporate welfare. Also, rather than use IOR to reduce the supply of available fiat (aka reserves in the case of depository institutions) why not increase the demand for fiat by allowing all citizens to use it in the form of inherently risk-free accounts at the central bank itself and abolish government-provided deposit insurance? I support a zero interest rate policy, and so do some of the leading academic MMTers. The point in the post is to consider the effects on balance sheets of the different operational approaches. Since central bankers, under many circumstances, will wish to maintain a positive policy rate, it seems relevant to compare the effects of paying (positive) interest on reserves as a simpler and more transparent alternative to issuing interest-bearing treasuries. As for private credit creation and the private ownership of banks, I’d prefer the banking system to be nationalized. I am supportive of basic income, but my preference is for a combined ‘job or income guarantee’. See, for example, this post. More posts on the topic can be found in the Job and Income Guarantee category. Because taxes drive the currency, a job guarantee plays a critical role in MMT. Some of the academic MMTers oppose any kind of basic income measure. Others are open to some kind of combined program or at least retention of unemployment insurance. For instance, here is a recent tweet by Pavlina Tcherneva. I’d prefer 100% private banks with 100% voluntary depositors, a situation that has not yet existed to my knowledge since it should be considered a normal duty of a monetary sovereign to provide inherently risk-free accounting and transaction services in its fiat for all citizens rather than leave them at the mercy of private banks. Meaning the central bank lends to depository institutions at 0%* rather than penalty rates? Isn’t that welfare too**? *Because presumably interbank lending breaks down at 0%? **Actually, any lending by the central bank to the private sector can be construed as welfare. No that does not make sense since the interbank lending rate would never reach 0% unless the loans were over-collateralized such that a default would profit the lender. So direct loans from the central bank at 0% are meant to preclude or contain liquidity crises? Where banks are afraid to lend to each other? Even so it’s still welfare for a usury cartel and by extension for the rich, the most so-called credit-worthy. There is a solution that does not require welfare for the banks and that includes an alternative payment system at the central bank to the one that must work through the banks but instead consists of the accounts of individual citizens, their businesses, etc. “About the only reason we should pay bankers to do anything is if they can demonstrate the skill of underwriting capital projects against a prospective income stream. In simple terms this means somebody going into a bank with a proposal that requires a certain amount of money. The bank staff considers whether the prospective income stream proposed to repay that money is adequate to repay the loan and pay the wages and costs of the bank – including a reasonable return to whatever risk capital underpins the bank. Loans from banks would have to meet very narrow criteria otherwise they are unenforcable and become a gift. Perhaps we should discuss this in another post, since it seems quite important and a point of disagreement. We can completely agree on that. Neil Wilson does not grasp that prudent banking is not necessarily ethical banking. What does being able to repay what is essentially the publics’ legally stolen purchasing power have to do with anything except efficent theft? Example: Suppose I request a loan to completely automate my business and can show an income stream to justify that loan? Is the loan morally justified in that I am using the publics’ credit to disemploy the public? For private gain? 1) Why not a guaranteed income instead? 2) Why pay people to waste their time when the point of automation should be to free people – not to change their masters from the private sector to the public sector? Does not everyone use the “public’s credit” for “private gain”? Perhaps not. But individual businesses come and go though and I think *in aggregate* it is worthy thing to promote. I would prefer bank lending to be for new projects and businesses. Furthermore why should a group of middlemen get money for basically nothing as business slowly eliminates jobs? Even if those middlemen are citzens with fiat bank accounts from guaranteed income. Another point completely ignored by the MMT folks is *fuel* – machines require it and they are *not very useful scrap* without it. 1. Resentment. Our social structure requires a quid pro quo. And yes many of the wealthy have cheated that through various means. Equality of opportunity includes dealing with those trust funds that give some people a head start they don’t deserve. 2. People still need something to do with their day or tehy get very bored and isolated or worse are recruited by extremists. Doing leisure costs money. By which I mean all money comes from the government, of course. Additionally because most people will still be working. Most guaranteed income just pair with tax rises, which triggers resentment as people are given money and then it is taken away. Freedom means freedom to work too and not just involuntarily for someone else, be it the private sector or the State. True. But work does not just appear out of thin air, and the right to payments have to be justified to the wider electorate. And in some cases it will be just formally being payed for what you already do. The BI is free market on what people do. The JG is about ensuring everybody has access to socialisation *by right*. The ‘free market’ at the moment is right wing extremists of various sorts. Please think about this. Sure it does unless one’s desired work requires resources such as land and tools one does not have. Not a UBI since every citizen would receive an equal amount. People would have to be spiteful to deny themselves to punish others. These teenagers all have their living expenses paid for by others. Under the rules of Basic Income something for them to do is supposes to magically pop up by the mystical power of laissez faire. 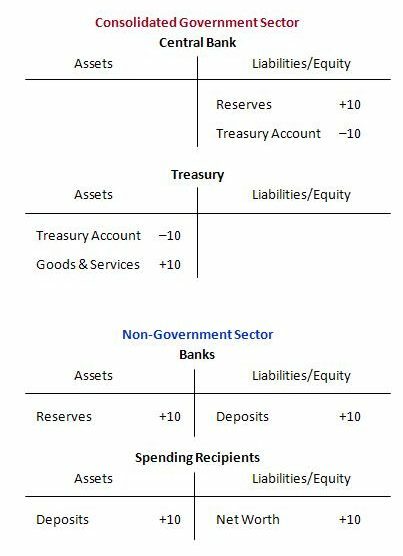 Step 2 seems to have lost the assets of the Central Bank and the Liabilities of the Treasury, neither of which would be extinguished by Treasury spending/private sector depositing recipts in a commercial bank. Yes, in the abbreviated balance sheets, only the changes in financial assets and liabilities that occur at each step are shown. You are quite right that the central bank still possesses the bonds as a financial asset as a result of step 1 and that these are still a liability of the Treasury. In the post, the purpose of the abbreviated balances sheets is just to single out the financial effects of each step. This seems to be creeping closer and closer to HB2990, The 2012 NEED Act. Why not go all the way?